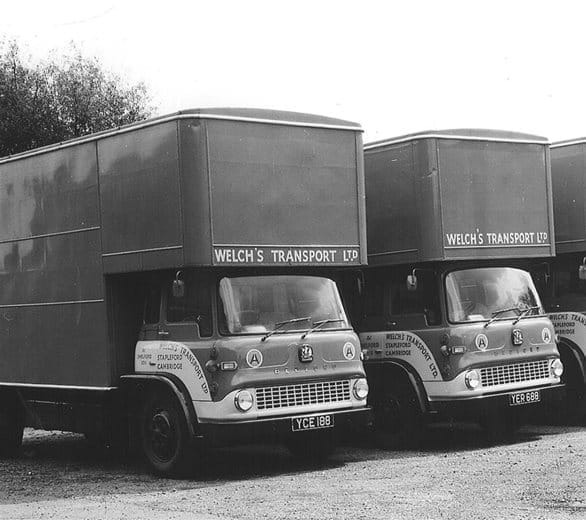 From starting our journey in 1978, our family-run team has come a long way and the experiences we have gained have opened up great opportunities within all aspects of load movement, whether across a factory floor or across the country. Operating alongside our Crane Hire division, we have a combined experience dating back to 1953, meaning we can find new and innovative solutions for all of your abnormal lifts and loads. Welch’s Transport receives its biggest ever contract for BHS (British Home Stores), handling all its warehousing, collections and deliveries, supported by 100 vehicles. This lasted until the late 1970s when the contract was sold to Christian Salvesen. The 1970’s opened up the door to working with Duxford Imperial War Museum. We still continue to work closely with the museum. Tony Welch enters the business and starts his training as a workshop engineer — third generation. In 1987 Jim Welch enters the business taking control of the accounts department – third generation. MJA Movements is started in a small Cambridgeshire village. Cambridge University’s Cavendish Labs started working with MJA Movements. With the 80’s came the beginning of Welch’s Specialist Movements working with Marshall’s Aerospace. Martin Burgess started his career with MJA in 1997, he is now the Operations Manager. Welch’s acquires MJA Movements with its 25 years’ industry experience of moving specialist loads, forming Welch’s Specialist Movements and the added service of moving abnormal, scientific and fragile loads. Our Operations Manager, Julie Payne, joins the Specialist Movement team in 2005 and has been ensuring things run smoothly ever since. Welch’s Crane Hire teamed up with Welch’s Specialist Movements, offering all services from the one site in St Ives, Cambridgeshire. 2013 saw the removal of Finback Whale from Department of Zoology for storage while refurbishment was taking place. Changing London’s skyline with the installation of “Twin Towers” digital advertising screens. Welch’s Specialist Movements brings home a piece of British history from France, now on show at Duxford Imperial War Museum; the last surviving ‘whale’ section of the Mulberry harbour from the beaches of Normandy. Sees the arrival and grand unveiling of a UK-unique crane trailer; with a 10.5m extendable bed and 13 tonne payload, combined with its mounted crane which can lift 2640kg at its full reach of 17m.